This session gave participants the opportunity to build their own instruments and investigate these sounds with microphones and digital processing. The group began by discussing different types of instruments which could be made with the items provided; balloons, string, boxes and pipes, among other everyday objects. Breaking into three sections, strings, percussion, and wind, instruments were constructed and investigated acoustically. Drums fashioned out of balloons, horns from pipes, and a stringed instrument constructed from a balloon, a cardboard box and twine were hit, blown, and bowed as members of the group began to test their inventions possibilities. 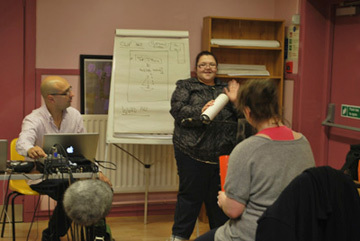 Sound resonance and our ability to feel the vibrations of certain instruments via our sense of touch was also explored. Microphones and a computer were set up allowing members to utilize different methods of amplification and digital processing upon their instruments. Some members drummed on the floor, others beat their makeshift drums, and strings were bowed at different speeds and volumes, one after another, while a member of the team from Sonic Arts Research Centre began to sample, manipulate and layer different sections of instruments together. This workshop served as a way of demonstrating to participants, in a hands-on manner, the acoustic effects of different objects, the range of possibilities attainable when capturing sound via microphone and simple digital signal processing, concepts which are not only revealing in terms of the “Sounds of the City” exhibition, but also to the wider field of sonic arts.